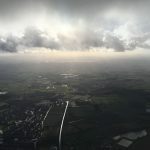 Every forecast except UKMO said the conditions would be flyable on Sunday but overnight rain put a big question mark over the usability of the field. We set up an unusual field configuration. With the winch at the west end and the launchpoint on the SE stub, the landing area was marked out with our new ‘hi-visibility’ technique between the clubhouse and the cross-track parallel to the north fence. This gave us a 20x200m landing area, easily achievable in the ~25kt westerly wind. With this area of the field being solid enough to support the aircraft, they could then be retrieved south down the hard runway. We kicked off with a K13 and the Junior as the club’s K21 was parked at the back of the hangar and we wanted to test the load-bearing ability of the airfield. Pre-solo and early solo members requiring checks had their mettle tested by conditions that were generally described as ‘sporting’. Launch heights were excellent and there were early soaring flights in the Junior. The K21 came on line in the late morning to pick up the demand for instructional flying while the wind strength increased somewhat. 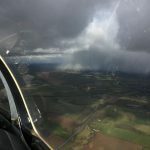 The density of the cumulus cover increased until it became apparent that there were wintry squalls around. 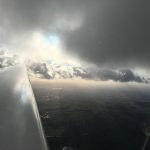 The darkness of some areas of cloud bottoms suggesting cumulonimbus in places. Thankfully, the squalls were going around us so we could keep the launches going. Our luck couldn’t hold out forever however and a fast-developing local squall appeared just north-west of us. A recently-landed K13 beat a hasty retreat back to the relative shelter in front of the hangar and the cable retrieve Land Rover abandoned it’s normal duties and sprinted across the field to provide shelter to the K21 as it arrived back in the landing area. The squall brought in a significant increase in wind strength and light sleet/hail so the landed K21 held position behind its Land Rover shelter for quarter of an hour. 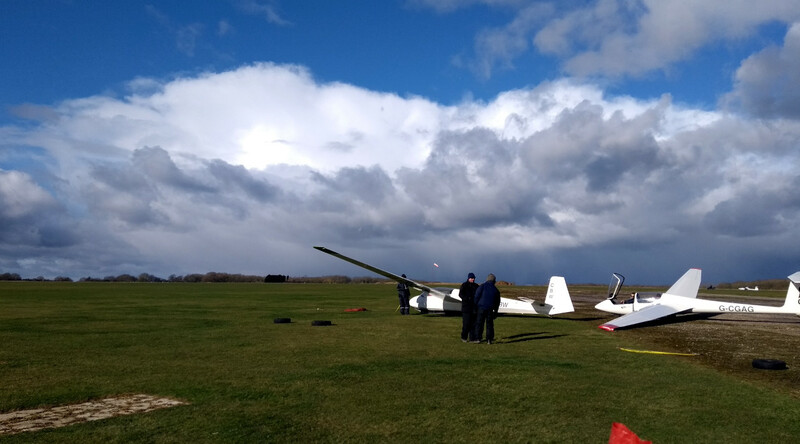 Even before the squall had gone through, it was apparent that conditions beyond still looked good so as the hail dissipated and the wind reduced, the K21 was towed back on-line to launch. As we launched the K21, the K13 was brought back on-line from the hangar area so we could continue around the flying list a second time. 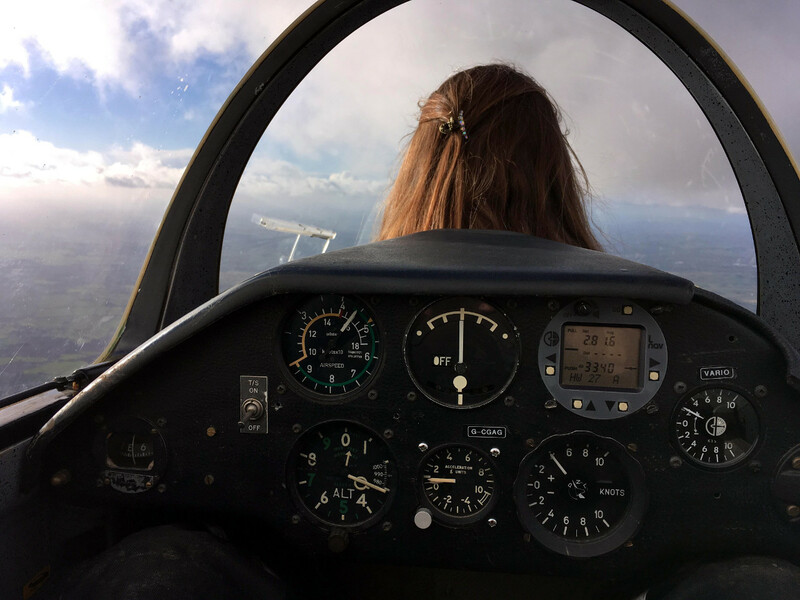 As well-developed streets of cumulus passed over the field, Dan took pre-solo junior glider pilot Jenna up as a passenger in the K21. Contacting strong lift, they had a soaring flight of over half an hour, encountering lift as strong as 6 knots and peaking at 3,800feet AMSL. The sky-scape in the mid afternoon had it all with cumulus formations, distant squalls and sunrays playing across the landscape below. 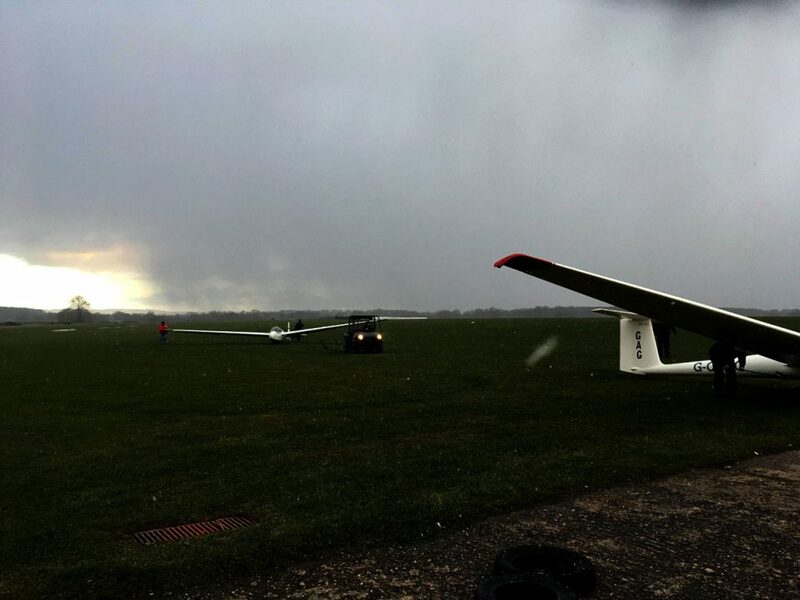 Towards the end of the day, another fast building squall developed just upwind of the airfield. 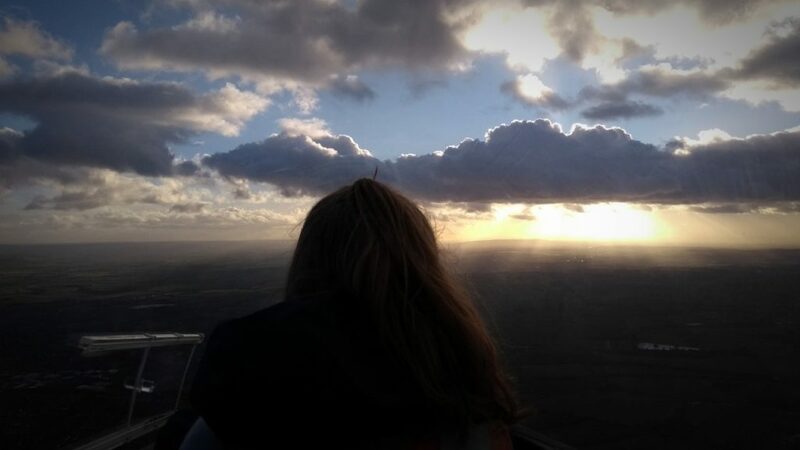 Coupled with fading light and the expediencies of airmanship, we decided it was the last flight and took the aircraft back to the hangar for a wash-down.